Households Below Average Income, Department for Work and Pensions. Restricted access via UK Data Service. in London are less likely to be in a family able to afford basic items, in almost every category. 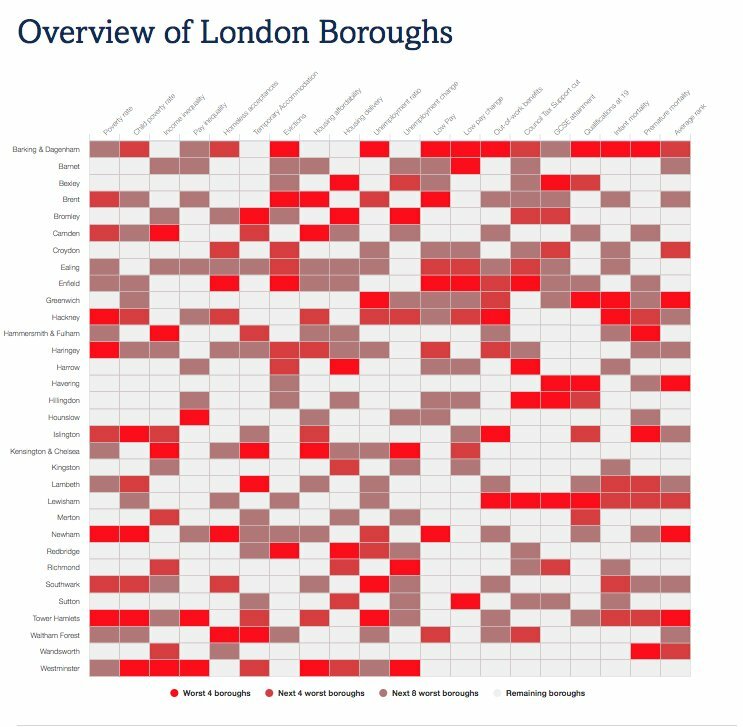 children in London (28%), lack several basic items on the basis of cost and so are considered materially deprived. This is higher than in England, where 20% of children are materially deprived. of children in London were materially deprived five years earlier, indicating improvement on this measure. Figure 3.10 looks at the proportion of children in households in poverty unable to afford each item on the basis of cost. 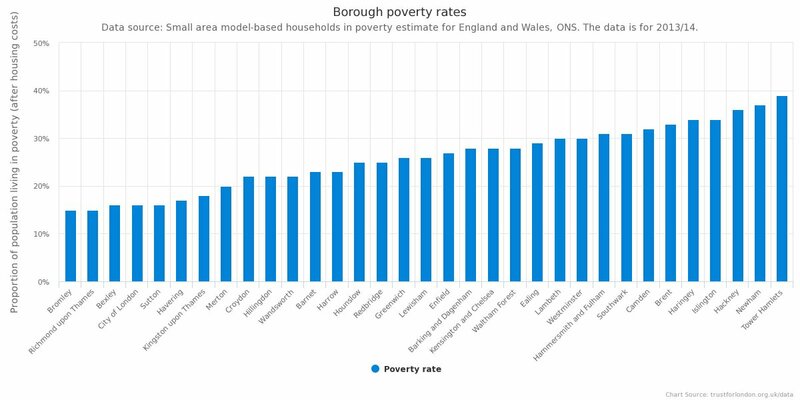 We are interested in this because, although the basic income poverty measure can account for housing costs, other costs that are higher in London do not feature. One way of rectifying this problem is by looking at ‘material deprivation’, which is the state of being unable to afford several basic items as a result of cost. A household is considered materially deprived if it has a ‘score’ above a certain value. Lacking an item contributes to the score, and the more common a lacked item, the higher the score attached to it. Overall, 530,000 or 28% of all children in London were materially deprived. This rate has fallen from 32%, the figure both five years earlier and a year earlier. In contrast, 20% of children in the rest of England are materially deprived. The higher levels of child material deprivation in London are not simply the result of higher levels of child poverty. Children in London have a higher material deprivation rate whether they are in poverty (49% compared with 43% in England) or not in poverty (16% compared with 12%). Turning to individual items, the most common thing lacked by low-income children in London is a one-week holiday away from home, which 58% do not have. This is also the most common in the rest of England. The biggest gap between London and the rest of England is for leisure equipment such as a bicycle: 21% of children in London in a low-income household lack this, compared with 13% in the rest of England. 300,000 children in London are missing three or more of these items, and 200,000 of these children are missing four or more of these items.